An officer has been suspended after footage emerged of him putting a woman who had called the police in a headlock. 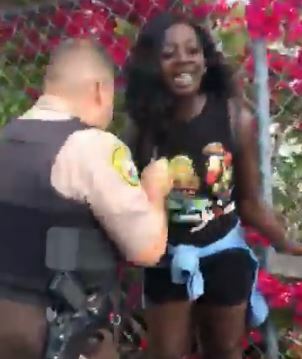 In the video, 26-year-old Florida resident Dyma Loving can be seen talking with the police before one of the officers, identified as A.I. Giraldo, forced her to the ground, despite her protests. According to a police report obtained by Huffington Post, the authorities were called to the scene after Dyma said she had been threatened by a neighbour. 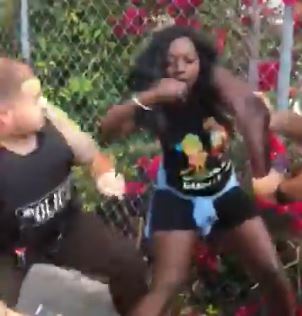 Speaking to the publication, the 26-year-old explained other officers had the situation under control, but then Giraldo arrived as backup and began arguing with herself and her friend, Adrianna Green. The officer reportedly told Dyma to ‘calm down’, and refused to let her go and charge her mobile phone so she could call her daughter. 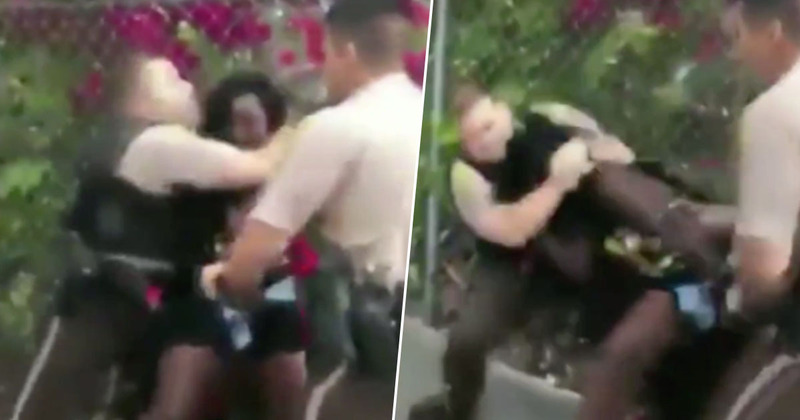 In the footage, which has been shared on social media, the officer can be heard saying the woman who called the police needs to be ‘corrected’. Dyma argued back, asking why she’s the one who needs to be corrected when her life was threatened, and Giraldo suddenly moved in to grab her. 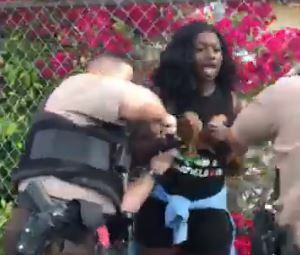 He appeared to be trying to put handcuffs on the protesting woman, but then grabbed her in a headlock and pulled her to the ground as she protested, saying ‘do not touch me’. The officer then handcuffed Dyma before aggressively pulling her to her feet and leading her away. Dyma faces charges of misdemeanors after the incident. Speaking to HuffPost following the incident, Adrianna, who filmed the video, explained how the neighbour ‘turned around and he just pulled out his shotgun on us’. He’s actually threatened to shoot my brother in the back, multiple times. I know he has guns. I’ve seen the guns. He goes hunting. Dyma told the publication how she won’t be able to ‘see police officers the same’ after what happened. None of them. Because I literally called [them] for help with my life and that’s how [they] treated me. … [They] beat me up. Why should my friend be arrested for telling the cops what was going on. We were just telling them the situation and it was her adrenaline going. 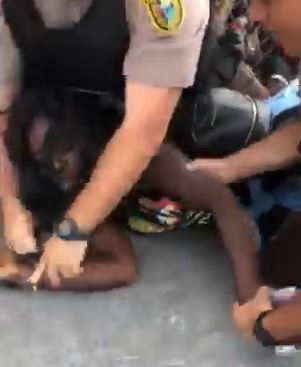 The Miami-Dade police tweeted a statement following the situation, where Police Department Director Juan Perez called the actions ‘deeply troubling and in no way reflective of our core values of integrity, respect, service and fairness’. I will hold those that violated any of our policies and/or procedures accountable for their actions or lack thereof. Giraldo has been relieved of duty and the incident is being investigated. He needs to be outright fired. Everything about that was wrong. I thought he crushed my throat. I couldn’t talk for three days. Even now it hurts a little bit to talk. The actions of the officer in the video are truly shocking.